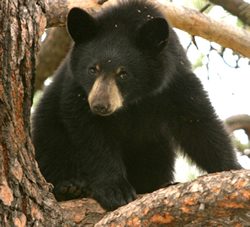 Missoula Bears is an informational resource for residents living with wildlife in the valleys around Missoula including the Bitterroot, Blackfoot, upper Clark Fork, lower Clark Fork and Mission valleys. 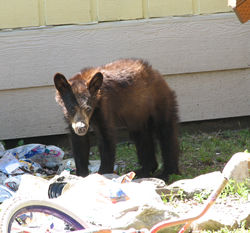 This website is a result of years of working to minimize human-bear conflicts, beginning with Missoula residents in the Rattlesnake neighborhood in 2004. In 2009 we expanded our efforts to include all of Missoula county and now, due to increasing interest and an expanding Northern Continental Divide (NCDE) grizzly bear population, we are covering the five valleys around Missoula. Historically, Missoula city and county was full of wild, open spaces, excellent habitat and bountiful wildlife including black and grizzly bears, moose, elk, deer, lynx as well as many other species. Starting in the mid-late 1800’s European human development began fracturing portions of this habitat. Wildlife-human conflicts began as habitat was developed and wildlife had to increasingly navigate roads, homes, livestock and more. As bears become food conditioned and/or habituated to human activity their actions may be deemed a human safety risk. 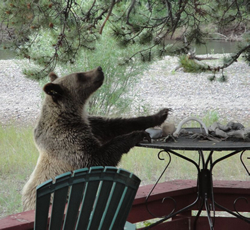 For example, bears that frequent porches for bird feeders or break into chicken coops near homes. As a result, these bears are often removed by management agencies because they pose a threat to people or, occasionally, they are killed by residents. The primary cause of death for bears in the Missoula area and surrounding valleys is human-related. These deaths are often preventable. • Reducing the amount of time FWP spends addressing bear conflicts each year, allowing FWP to use their time more effectively in other areas of concern. Photo credits: Image 1 by K.Quinn Ellis, image 2 by Dave Jarmon, image 3 by Bob Wiesner.